Ancient Stones - Lothian - 029 Witchis Stane, Platt Hill, Ratho. Platt Hill can be seen to the north west of Ratho, a small village to the west of Edinburgh. 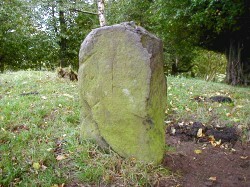 Near the trig point a single standing stone can be found and is known locally as the Witchis Stane. The stone measures 0.95m high x 0.60m wide x 0.30m thick. There are considerable stone works, such as walls, in the immediate vicinity and it is possible that The Witchis Stane formed part of these works, although its actual purpose is now forgotten. A couple of fallen and similar stones can be seen nearby. One measures 1.40 x 0.42 x 0.30m, the other 1.70 x 0.45 x 0.30m. Parking as noted below, follow the road north and then veer left along a dirt road, just as your leave the village. This track will take you along the north side of Platt Hill. You will need to climb over the fence and ascend the hill to reach the stone. In Ratho village or in parking area beside the church on the north side of the Union Canal. The stone and surrounding area is reputed to have been associated with witchcraft and possibly witch burning. This stone certainly looked the part and does appear to be similar to other standing stones in the area. The problem arises that the site has been reworked extensively with much of the stone from the hill fort having been reused to construct agricultural enclosures. 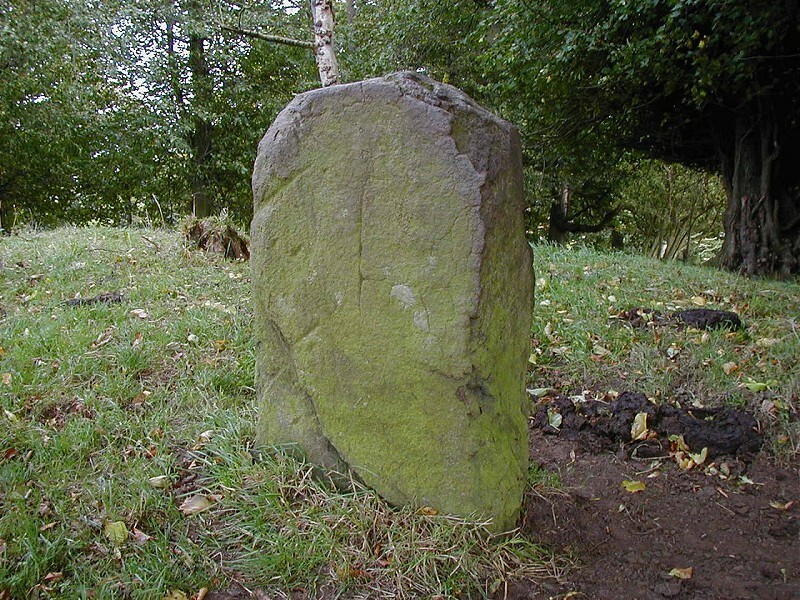 The two recumbent stones may hint at quarrying in the vicinity and the Witchis Stone may have been erected relatively recently. At the time the improvements on the hill were going on, a tradition existed of a woman's having been burnt here for witchcraft. This led to an examination of the spot specified as the scene of the superstitious execution, when a quantity of burnt ashes were found quite entire.